Santa Fee (ATSF) in the mid west. or you can move from each page to the next with a link at the bottom of each page. It is 5/10/2010 and I am just to start my 4th model railroad. I have reloaded some pages from the last railroad so much of what is below does not work and will be removed as I develop this as a new page. Started in fall 2004, it has an allocated clear space of 12 feet by 24 feet with no windows and one 34" door near one corner. 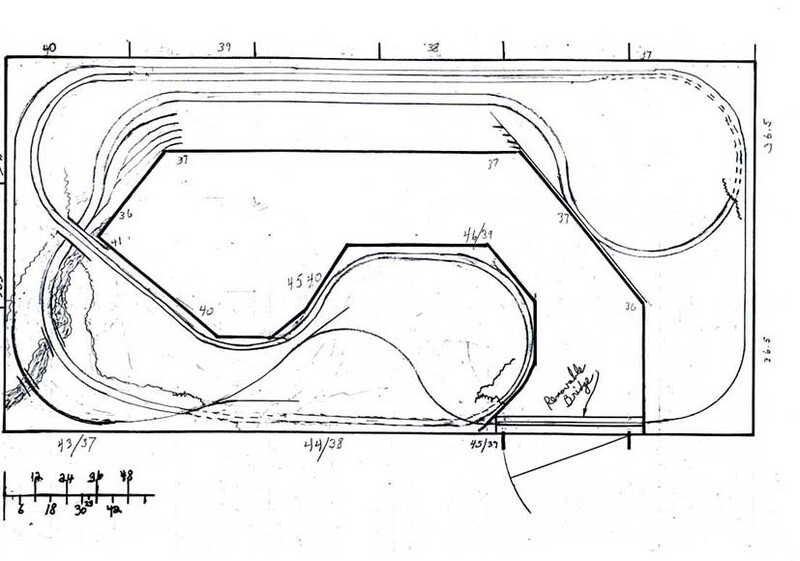 Basic layout is a Dog Bone around the edge of the room with both East and a West main line tracks, several interactive staging yards and a major service and shop yard adjacent to one loop. Bench work is 1x4" joists on 3"x4"/1"x2" L girders, with ribbon and cookie cutter track base of 1/2" finished one side plywood.. The double main line curves are 30" minimum and no curve anywhere less than 24", using #4 and #6 DCC ready turnouts and code 83 brown tie flex track. I choose a full double main so that by myself I could set trains to just run while I actually drive another. While it takes up considerable space, it fits a one man operation out here in the sticks where I live. This is my fourth railroad. As a young teenager in the 1950's I had two 4x8 sheets of plywood for a simple American Flyer layout in my folks basement. Portable enough that one 4x8 sheet went upstairs under the Christmas tree for a number of years. 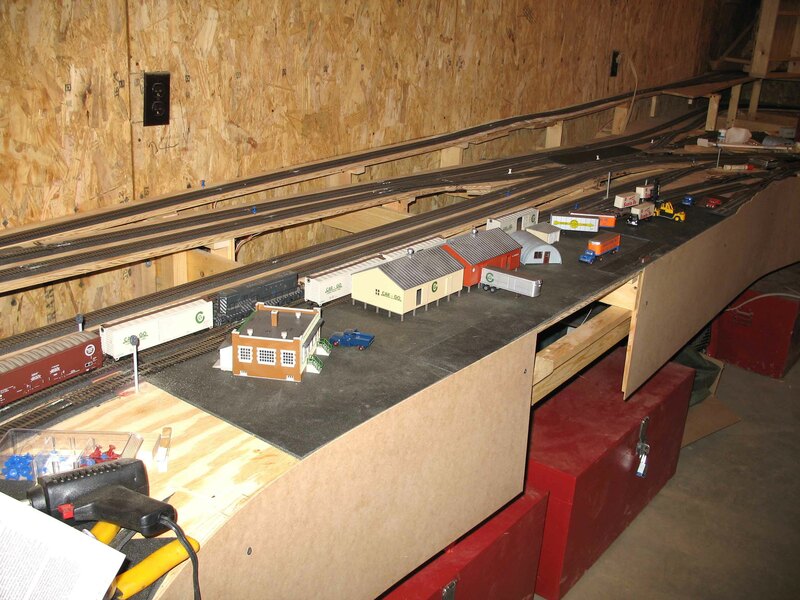 The second layout was as a father and the first using the grid bench work system and all the electrical blocks for multiple HO train operations of the 1970's. As a grandfather, the third railroad is grid bench work and took me into the new world of DCC, right from the get go. I bought "a bunch" of used Digitrax equipment from a fellow who had a 48 x 20 foot layout in the basement of his now sold home and I was going to install that later, but later never came as we sold the ranch. This fourth layout is grid bench work too and again vintage mid 1950's, following the Santa Fee (ATSF) from the mid west heading west. I have chosen to take scenes I particularly like rather than trace an actual stretch of prototype trackage. My idea for this web site is to follow along through the stages of development ... from concept to a detail diagram, bench work, track laying and so forth. Digital pictures along the way may be more fun that the words. As I start out it looks like a new page for each stage but time will tell how that idea comes along. I have been astounded how easy and quick it is to lay road bed and then track. Using Woodland Scenes 20' rolls of road bed and DAP adhesive (clear), it goes quite rapidly. 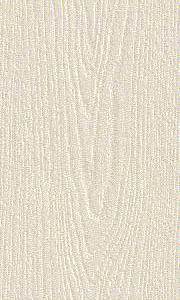 The adhesive is applied sparingly with a caulking gun and smoothed out (very thin) with a putty knife, and roadbed is easily laid along a guide mark I scribe along the cardboard cut outs for curves or a straight line between the curves. I cut half circles of cardboard in 22", 24", 26", 28", 30' 34", 36" and 38" circumference and the width of the roadbed ... using them first to cut plywood sub road bed and then to set up and mark other curves prior to laying roadbed. I can't stress enough how important and easy these cut outs were, to move around to get just the right curve as the area needed, switching from various radii until it was a smooth transition curve to straights. 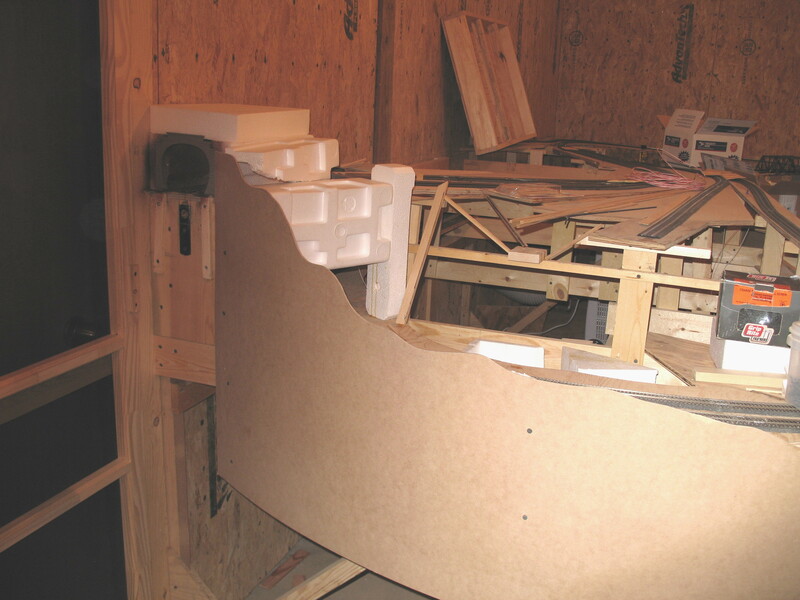 I suggest that others just starting, make there own set of curves right up front and experiment while laying out the sub road bed on the plywood . Flex Track was set up the same way, laying a small bead of adhesive on the roadbed with the caulk gun, smoothed with the putty knife and several sections soldered together laid at a time (a must for sweeping, long curves and tunnels). The adhesive holds tight from the get go but allows plenty time for adjustment too. I had the full curve of a reverse loop soldered together and then slipped it through the framework. It takes a little planning but saves a lot of frustration working in and out of bench work and tunnels. This system removes ALL of the drudgery of tacking track bed and tacking track to hold curves, etc. Of course, I solder batches of two sections of code 83 flex track together to facilitate laying track. I cut two or three ties from each end of the flex track for curves and solder together (two ties for straights), cutting the track holding pins from the sections removed and then later gluing then beneath the track to fill the openings. A Dremel with a flat grinding disk works great for precision cutting of the flex track and with a little practice you will not go through as many disks as I did when I started :-) !